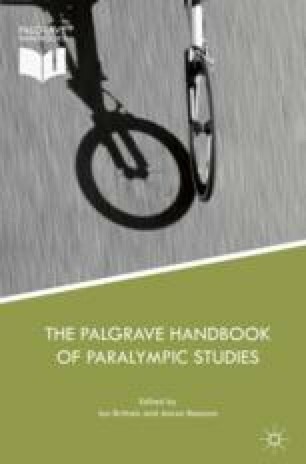 The introductory chapter begins by outlining the decision to develop the publication as a companion volume to the Palgrave Handbook of Olympic Studies. It identifies disability sport generally and Paralympic sport more specifically as a recent phenomenon, still in its formative years, and relates this to a wider consideration of developments in disability rights. It maps the essential elements relating to the six sections of the Handbook, which, taken together, provide a critical assessment of contemporary issues defining the contours of the Paralympic Movement. It discusses the approach taken by the editors to ensure the Handbook achieves balance between depth and breadth of material necessary to provide critical insight. Active Policy Solutions. n.d. Know Your Rights: Disability in Sports. www.activepolicysolutions.com/know-your-rights-in-disability-sports/. Accessed 16 March 2017. IOC. 2015. Academic Olympic Papers. Available Online. Olympic Studies Centre. https://stillmed.olympic.oorg/AssetsDocs/OSC%20Section/pdf/Annex%205%20-%202011%Academic%20papers%20available%20online.pdf. Accessed 16 March 2017. IPC Website. 2017. Rio 2016 Paralympic Games. https://www.paralympic.org/rio-2016. Accessed 16 March 2017. Laureus. n.d. Development of Sports and Rights for People with Disabilities. https://www.laureus.com/projects/africa/development-sports-and-rights-people-disabilities. Accessed 16 March 2017. LaVaque-Manty, M. 2005. Equal Opportunity to Meaningful Competitions: Disability Rights and Justice in Sports. Disability Studies Quarterly 25 (3). http://www.dsq-sds.org/article/view/573/750. United Nations. 2006. UN Convention on the Rights of Persons with Disabilities. https://www.un.org/development/desa/disabilities/convention-on-the-rights-of-persons-with-disabilities/convention-on-the-rights-of-persons-with-disabilities-2.html. Accessed 16 March 2017.